Packaging Details Height Width Depth Weight 3.15" 4.55" 0.65" 0.11 oz. Details Dietary supplement. 30 Foil packed 1079 mg tablets. 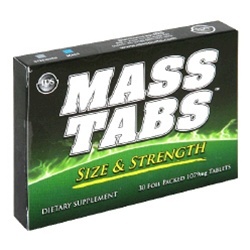 Mass Tabs is designed with pharmaceutical grade natural ingredients to assist in muscle growth and strength when combined with adequate protein intake and strength training. (The statements on this label have not been evaluated by the Food and Drug Administration. This product is not intended to diagnose, treat, cure, or prevent any disease.) Made in USA. Nutrition Facts Serving Size 1 tablet Servings Per Container 30 Amount Per Serving % Daily Value Proprietary Mass Tabs Blend 87,000 mcg *percent Daily Values are based on a 2,000 calorie diet. Ingredients: Proprietary Mass Tabs Blend: Kudzo Extract (40%), Trifolium Pratense Extract (8%), Fenugreek Seed Powder, Tribulus Terrestris Extract (40%), MethylSten, Avena Sativa Extract 10:1, Pygeum Africanum Bark Extract 4:1, Milk Thistle, Maca Powder Extract (6%), Epimedium Leaf, Bacopa Monniera Extract 4:1, Rhodiola Rosea (3&), Nettle Leaf Powder. Other Ingredients: Microcrystalline Cellulose, Calcium Phosphate Dibasic, Croscarmellose Sodium, Pharmaceutical Glaze (Hydroxypropylmethylcellulose, Maltodextrin, Polyvinyl Alcohol, Macrogol/PEG 3350, Macrogol/PEG 400, Talc, Titanium Dioxide, FD&C Blue No. 2 Aluminum Lake), Stearic Acid, Magnesium Stearate, Silica. *These statements have not been evaluated by the Food and Drug Administration. This product is not intended to diagnose, treat, cure or prevent any disease. Directions Take one tablet every day for no more than 4 weeks, 30 minutes prior to training.